Behind the Counter Tours | Historic Jacksonville, Inc. 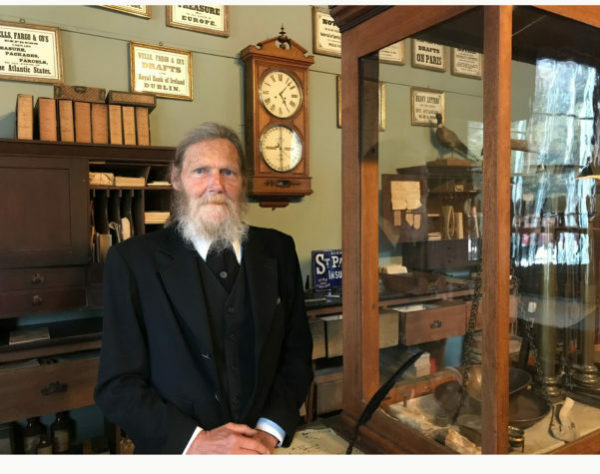 Experience how Cornelius Beekman, Jacksonville’s most prominent pioneer, conducted banking in the late 1800s when Historic Jacksonville opens the Beekman Bank, the oldest bank in the Pacific Northwest, for “Behind the Counter” tours from Memorial Day weekend through Labor Day and during Jacksonville’s Victorian Christmas celebration. Over $40 million in gold crossed the bank’s counters during Jacksonville’s heyday in the second half of the 19th Century (worth over $1 billion today). Interact with costumed docents sharing stories of late 19th Century banking practices, gold shipping, and handshake deals. Summer tours are offered from Friday through Monday between 11am and 4pm. 2019 Victorian Christmas tours are offered between 11am and 3pm on Saturday and Sunday from November 30 through December 29. The bank is located at the corner of California and North 3rd streets in Jacksonville. The current Bank building, constructed in 1863, has been preserved intact as a museum since Cornelius Beekman closed the doors in 1915. Over 4,000 people visit the Beekman Bank each year. Grants from the Jacksonville Lodging Tax Committee and your generosity make it possible for Historic Jacksonville to open this Jacksonville museum during the summer months and Victorian Christmas weekends. A suggested bank “deposit” of $3 will help us maintain this program and expand “banking hours” in the future. Private group tours are also available. For additional information, contact Historic Jacksonville at 541-245-3650 or e-mail info@historicjacksonville.org.